As previously noted, beer is delicious. Also, beer is fun. 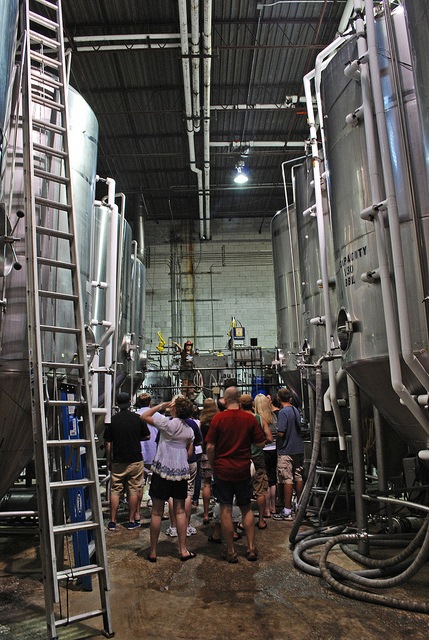 Ergo, a brewery tour with samples will be fun. Also, delicious. If you have the time to go to Baltimore for the day and either have a car yourself (or can convince someone with a car to go have a fun and delicious time with you), I recommend getting yourself on down to the Heavy Seas Brewery in Baltimore, hon. For $5, you get a souvenier Heavy Seas pint glass, five generous 5 ounce samples, and a guided tour of the facility by a trained beer professional with an authentic beer belly. You get the belly included with the price of admission! By the time you have had your samples of award-winning lagers, pilsners or ambers, you’ll be feeling very happy to learn about how the beer is made. Your beer-bellied tour guide will take you through the process, detailing how the hops or the malt are put into production, how the yeast eats the sugars in the cone-shaped tanks, and how the bottles are cleaned, filled to capacity and sealed until such time as you, the lucky drinker, chooses to open (and please, pour into a glass) the beer. Also, since you’re already in Baltimore, there are all kinds of other fun things to do there. I plan to go back soon and come back to DC again, convinced that yes, Baltimore is great, but DC is the place for me. Previous Post Short Films. So short!